We hope you all have successfully applied for the TNPSC VAO exam 2016 well before the last date for applying VAO Exam. About 10 Lakhs candidates have applied for TNPSC Village Administrative Officers Exam 2016. TNPSC VAO 2016 Exam Date as published in the notification is 28th February 2016. 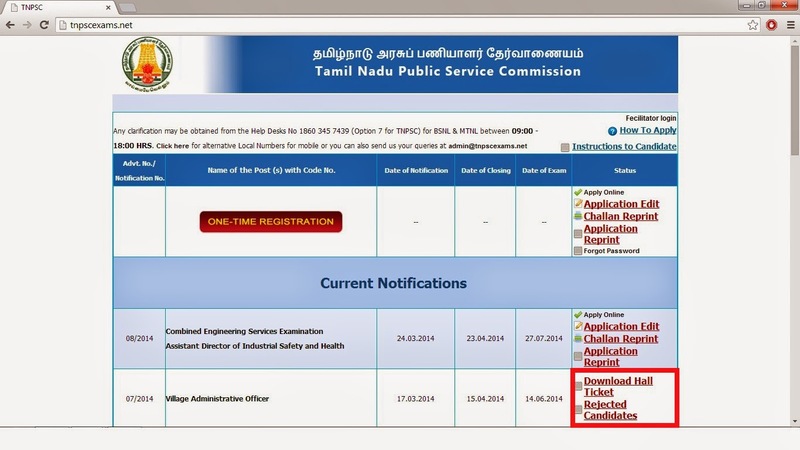 When you can Download your TNPSC VAO Exam 2015-2015 Hall Ticket? Two weeks before the TNPSC VAO Exam, the hall ticket of each candidate will be uploaded in the official site of TNPSC. This time we can expect the TNPSC VAO Hall ticket will be published between the Second week of February 2016 to third week of February 2016. TNPSC may also publish the application status for VAO 2016 Exam for all candidates online. Latest: TNPSC VAO 2016 HALL TICKET DOWNLOAD LINK http://182.18.164.63/tnpscadmincard19/frmLogin192015.aspx : http://182.18.164.63/tnpscen192015/Applicationstatus.aspx TNPSC VAO Hall Ticket will be published between the Second week of February 2016 to third week of February 2016. To Download TNPSC VAO 2016 Exam hall ticket Visit here http://tnpscexams.net/ Exact Link will be updated here soon.. TNPSC VAO 2014 Answer Key. Rejected Candidates list Link will be updated soon. How to Download TNPSC VAO 2016 Hall Ticket? Step 2: A new window like this may open now. How to Download TNPSC VAO hall ticket?